Saudi Aramco’s business is the economic foundation for Saudi Arabia’s prosperity. But it charts new territories to find ways to enhance its contributions to the national economy. This approach has empowered it to play a major role in the near 70-fold expansion of the kingdom’s GDP in just four decades. Saudi Aramco leverages its commercial activities to create multiplier effects that amplify added value and benefits for the people and communities where it operates. By acting strategically in the way it conducts and expands its business, Saudi Aramco successfully uncovers opportunities to enable more – more jobs, more investment opportunities, more localisation, and more diversification, says Saudi Aramco in its 2014 Annual Review. One way Saudi Aramco helps drive the long-term economic growth of the kingdom is through its investments in best-in-class oil, gas, refining, and chemicals facilities. These mega-projects are a powerful manifestation of its business strategy and provide direct economic benefit for the kingdom. But looking at them through the lens of citizenship, Saudi Aramco sees them – and their associated construction and infrastructure projects – as vehicles for the transformation and growth of the regions where they are located. Its Satorp and Yasref joint venture projects, for example, not only add to the development of a knowledge-based economy in the kingdom by providing technical job opportunities for thousands of Saudi technicians, engineers, and operators, they also incubate Saudi-owned small- and medium-sized manufacturers and service providers. Saudi Aramco is also laying the foundation for greater rewards for its industry and the kingdom by acting as a catalyst for the development of a Saudi energy services sector. The company supports the development of local businesses that manufacture energy-related materials and provide engineering and oil field services. These initiatives will help establish the kingdom as a strategic hub for energy service sector investment, both locally and internationally. In the wider society, Saudi Aramco focuses on training, apprenticing, and educating Saudis so they can fill the specialised jobs created by its efforts to grow and diversify the economy. The following sections – Maximising Its Impact, Enabling the Domestic Energy Sector, Building a Competitive Workforce in the kingdom, and Enabling Entrepreneurship – describe its focused approach toward strengthening the kingdom’s economy. The core of its business is oil, gas, refining, and chemicals. These are long-term and capital-intensive businesses that Saudi Aramco develops through world-scale facilities. The company applies its considerable project management experience to make certain these projects create sustainable economic benefits for the kingdom and its growing workforce. Wherever possible, Saudi Aramco capitalises on these projects to stimulate the development of adjacent manufacturing, supply, and conversion industries to drive even more economic growth and diversity. Its Sadara joint venture with The Dow Chemical Company is currently being constructed in Jubail Industrial City. Sadara will be the world’s largest integrated chemicals complex ever built in a single phase, with the production capacity for more than 3 million tonnes per year of diversified chemicals and plastics. It will be the first chemicals complex in the countries of the Gulf Cooperation Council (GCC) to use naphtha as part of its feedstock. 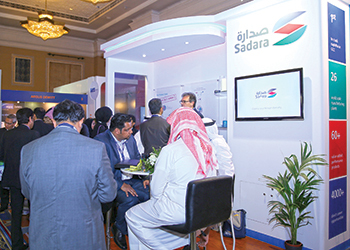 Fourteen of Sadara’s 26 world-scale manufacturing units are new to the kingdom. Their differentiated product slates are the building blocks used in high-performance flexible packaging, hygiene and medical applications, chemicals and additives for the oil and gas industry, chemicals for water treatment, soaps, detergents, cosmetics and other personal care products, as well as adhesives, brake fluids, and car seats for the automotive industry. Sadara is on track for an initial start-up in the third quarter of 2015 and all process units will be on-stream within one year of start-up. The project currently employs an estimated 2,500 staff (up from 1,500 in 2013). Over 250 apprentices and over 700 on-the-job trainees are undergoing comprehensive manufacturing and engineering training programmes in state-ofthe-art centres inside and outside Saudi Arabia. Ultimately, Sadara plans to employ more than 3,500 people while contributing to an additional 15,000 non-direct employment opportunities. The impact of Sadara on the kingdom’s economy will be further industrial diversification built on the growth of businesses capable of manufacturing consumer products from these new chemical streams. PlasChem Park, the industrial conversion park adjoining the Sadara complex, is currently being developed to house these manufacturers. Site development is anticipated to be completed in the first quarter of 2015. Work is also progressing on the structuring of Invesco, the investment vehicle that will support the development of conversion industries in PlasChem Park. Sadara’s integration with PlasChem Park is a prime example of how Saudi Aramco is advancing Saudi Arabia’s strategy to become a hub for future downstream industrialisation of chemicals and plastics. PlasChem Park will create more than 20,000 high-quality jobs, either directly or indirectly, for Saudi nationals. The company’s PetroRabigh joint venture is another concrete expression of how Saudi Aramco leverages its core business for the benefit of the domestic economy. By de-bottlenecking the existing steam cracker, Saudi Aramco can now produce more higher value-added and specialty ethylene- and propylene-based products. The upgrades will enable the conversion of 4,000 kilotonnes per year of naphtha into higher value aromatic products. This naphtha, which otherwise would have been exported, will be processed by the new Rabigh Phase II facilities to provide feedstock for downstream units that manufacture speciality petrochemicals or delivered as feedstock for third-party projects. Manufacturers who convert these chemicals into consumer products will be able to establish their businesses in the adjacent Rabigh PlusTech Park. At year-end 2014, agreements had been reached with tenants for 30 of the 34 sites in the park and potential tenants have been identified for the remaining sites. By 2015, it is expected that investments of up to $1.2 billion will have been made in the PlusTech Park and 2,000 new direct jobs will have been created. Promotion, marketing, and construction of the park, for which Saudi Aramco and Sumitomo Chemical are jointly responsible, will continue until all of the park tenants begin construction of their plastic manufacturing facilities. In April 2014, Saudi Aramco began marketing PetroRabigh products through its fully owned trading subsidiary, Aramco Trading Company. This development underscores its resolve to capture as much value from its resources as possible because every success Saudi Aramco achieves in this area contributes to corresponding success for the kingdom. The Saudi Aramco Total Refining and Petrochemical Company (Satorp), its joint venture with France’s Total in Jubail, is one of the largest, most complex refineries in the world. In August 2014, Satorp’s crude oil throughput reached the facility’s full design capacity of 400,000 barrels per day (bpd). The refinery produces low-sulfur gasoline, diesel, and jet fuel that meet the highest standards and specifications in the US, Europe, and Japan. This new venture will generate approximately 5,700 direct and indirect jobs and represents a major step in achieving its vision of being among the world’s top three refiners and a world-leading manufacturer of chemicals. A joint venture with Asia’s largest refiner, Sinopec, the Yanbu Aramco Sinopec Refining Company (Yasref), is a 400,000-bpd refinery designed to process Arabian Heavy crude oil from the Manifa field. Yasref, like all of its domestic downstream projects, provides multiple benefits to people in Saudi Arabia and in key markets. It will process Arabian Heavy crude oil, freeing lighter, more valuable grades for export; help meet domestic demand for refined products and export high-value products; provide feedstock for industry; generate direct and indirect jobs; and create opportunities for material and service providers. Yasref began commissioning in late 2014 and delivered its first shipment of clean diesel fuel in mid-January 2015. Within a few years of operation, Yasref, like Satorp, is expected to generate about 6,000 direct and indirect jobs for the community. The joint venture also enrolled approximately 700 Saudi employees in its apprentice programme to prepare them to assume full jobs in operations, maintenance, industrial relations, and engineering positions. In 2014, Saudi Aramco began construction on a project to build a refinery and terminal in Jazan in the kingdom’s southwest. The company’s wholly owned and operated Jazan Refinery and Terminal will become an integral part of its refining and distribution network. The complex, which also includes an industrial city, will help meet the kingdom’s energy demand and also export high-value fuels to international markets. The Jazan refinery, scheduled to begin commissioning in 2017, will have the capacity to process more than 400,000 bpd of crude oil to produce gasoline, ultra-low-sulphur diesel, benzene, and paraxylene. Saudi Aramco is creating more than 1,000 direct and 4,000 indirect jobs for Saudis through this project. An added benefit to the entire southwestern region is that the refinery will be incorporated with the world’s largest integrated gasification combined cycle complex. This will allow the refinery’s own operations to economically and efficiently generate 4,000 megawatts of electricity – enough to cover the refinery’s needs, enable the development of industries within the Jazan Economic City, and provide power for area communities. Saudi Aramco has been entrusted by the government to develop Jazan Economic City. Located in a coastal region known for its abundant natural resources and covering an area of 106 square km, the economic city will be a hub for a diverse platform of heavy, medium, and light industries. Phase 1 of the project, which will be completed in 2017, focuses on building smart infrastructure that meets the energy, utilities, and transportation requirements of a wide array of industries. These infrastructure investments will be complemented by several large-scale national projects including a new Jazan airport and a 660-km Jazan-Jiddah coastal railway. The city’s infrastructure development is designed to minimise investors’ start up time so they can begin operations as quickly as possible. The project is expected to substantially augment the economic output of the region and create 15,000 jobs in its first five years and rapidly scale up to generate more than 70,000 new jobs over a 15-year period. The city will boast a high quality of life that attracts and retains competitive companies and a dynamic workforce. This private-public partnership will set the standard for local economic development and serve as a model for building economic cities in the kingdom. Natural gas is a critical component of its strategies to help reduce the kingdom’s reliance on liquid fuel for power generation and to provide the foundation for further economic growth. The year 2014 also witnessed major progress in its ability to expand natural gas production with the construction of its Wasit Gas Plant, one of the largest nonassociated gas plants Saudi Aramco has ever built, and scheduled for start-up in 2015. At full capacity, Wasit’s integrated facilities will process 2.5 billion standard cubic feet per day (bscfd) of nonassociated gas from offshore fields. The cogeneration facility at the plant, also scheduled to start up in 2015, will have the capacity to generate 750 megawatts of electricity, making the plant self-sufficient in power with the excess delivered to other company facilities. The Midyan Gas Plant in the Tabuk region is its first such project in the kingdom’s northwest. Work on the plant commenced in 2013 and the facility is scheduled to be fully operational by the end of 2016. The facility is designed to produce and process 75 mmscfd of nonassociated gas and 4,500 bpd of condensate. The Midyan project will deliver sales gas and stabilised hydrocarbon liquids to the Saudi Electricity Company’s high-efficiency solar thermal power plant near Duba to generate electricity, displacing the use of high-value diesel. In its early phase, the Fadhili Gas Plant will process 2.5 bscfd from onshore and offshore fields and is on track to come on-stream by 2019. 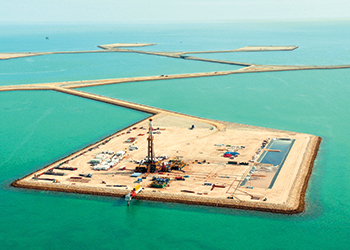 Drilling for nonassociated gas to supply the plant commenced in 2014 and Saudi Aramco issued the final project proposal in preparation for the detailed design phase during 2015. Together, its Wasit, Midyan, and Fadhili gas plants will add more than 5 bscfd of nonassociated gas processing capacity, further enabling opportunities in Saudi industries such as steel, aluminium, and petrochemicals; water desalination plants; electricity production; and downstream value-added industries to produce antifreeze, solvent, fuels, and other advanced materials. Unconventional gas has transformed the petroleum industry landscape. Its own unconventional gas programme continued to gain momentum in 2014. 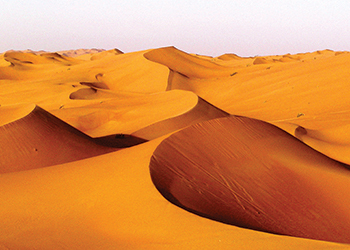 A sizeable investment in this alternative resource will help it assess, develop, and produce gas from shale and tight sand formations in three target areas: northern Saudi Arabia, the greater Ghawar area, and the eastern Jafurah Basin. In northern Saudi Arabia, gas will be delivered to Ma’aden facilities at Wa’ad Al Shamaal by 2016 and by 2018 additional gas will be made available for local power generation. In the greater Ghawar area, work is progressing at the Harmaliyah development pilot to obtain technical and operational knowledge and exploration and appraisal work is also ongoing to extend the reservoir base. Fracture stimulation results in the Jafurah Basin have confirmed the presence of an unconventional hydrocarbon resource. These unconventional gas resources have the potential to complement future inkingdom gas supply, support efforts to displace the use of liquid hydrocarbons for power generation, and increase available feedstock for the growing electric power and chemical industries. By developing its unconventional gas programme, Saudi Aramco will help meet the kingdom’s energy needs with cleaner burning natural gas. Producing unconventional gas is resource-intensive, requiring specialised skills and training and will therefore stimulate demand for advanced support sectors and generate additional direct and indirect jobs. Saudi Aramco continued work on two major projects at the Shaybah field in 2014. First, Saudi Aramco is raising oil production capacity by 250,000 bpd for the second time, bringing total oil production capacity to 1 mbpd of Arabian Extra Light crude oil by April 2016 – double its original capacity when it came online in 1998. Second, during 2014, major construction of the new NGL (natural gas liquids) recovery plant was 96 per cent complete. The NGL facilities are expected to help it meet increasing demand for petrochemical feedstock by recovering valuable NGL from produced gas. The project also includes a major upgrade to increase the plant’s power generation capacity to more than 1 gigawatt. Successfully put into initial production in April 2013, its Manifa crude oil increment was approaching its full production capacity of 900,000 bpd of Arabian Heavy crude oil at the end of 2014. Manifa will also produce associated gas as feedstock for industrial cities to help fuel economic diversification. A Unesco Environmental Responsibility Award nominee, the Manifa project’s innovative engineering design was created to optimise the field’s production capacity while caring for the environment. Saudi Aramco constructed 3 km of bridges, spanning the migration paths of various marine species to maintain natural water flow and preserve marine nurseries. These capital investments in oil and gas production signal its commitment to remain the world’s most reliable supplier of petroleum energy. Saudi Aramco is the world’s largest crude oil exporter, producing roughly one in every eight barrels of the world’s oil supply. It also maintains the world’s largest spare crude oil production capacity, ready to stabilise the global oil market in times of disruption. Ultimately, all at Saudi Aramco know it is not just about how much it produces; it is how it does it and what it does with it that matter the most. Inherent in its energy resources is the potential to create products and industries to diversify the kingdom’s economy and generate high-quality jobs. In its hands, energy is opportunity. Similar to the approaches to increase local content undertaken in global energy hubs such as the US, Norway, and Brazil, Saudi Aramco is working to facilitate the development within Saudi Arabia of an economic ecosystem that helps attract, establish, and promote domestic energy-related industries that are globally competitive and create employment opportunities for the citizens of Saudi Arabia. A significant part of this approach is further localising the supply chains these companies require. Saudi Aramco expects to increase its proportion of domestic spending on energy-related supplies and materials from 35 per cent to 70 per cent over the next decade, potentially creating between 400,000 and 500,000 direct and indirect jobs in the kingdom through this effort. Saudi Aramco intends to leverage billions of dollars in spending toward meeting these goals. 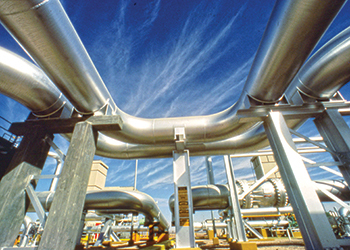 In 2014, Saudi Aramco charted progress toward the creation of a Saudi energy services sector. In 2014, Saudi Aramco completed the transfer of the entire fleet of 20 tankers from Vela, its former shipping subsidiary, to the National Shipping Company of Saudi Arabia (Bahri). In addition, all vessel-based crews, all shore-based personnel, and Vela’s operation systems have been integrated under Bahri’s new organisational structure. By divesting its shipping business, Saudi Aramco is strengthening the capability of the kingdom’s domestic energy sector, creating efficiencies of scale, and enabling new opportunities for growth in the kingdom’s shipping industry. The Ras Al-Khair maritime yard is a prime example of how Saudi Aramco plans to energise the localisation of energy sector industries through the creation of "anchor projects" around which entire supply chain ecosystems can develop and grow. Its maritime yard initiative will result in a world-class shipyard and supporting ecosystem in Saudi Arabia. By leveraging its considerable spending on engineering, procurement, and construction, Saudi Aramco anticipates attracting qualified partners and their supply chain of vendors and manufacturers. To support the development of a specialised workforce to support this new industry, Saudi Aramco signed a Memorandum of Understanding with King Abdulaziz University to coordinate its efforts to promote the teaching of disciplines related to the marine industry. It is evaluating other potential sectors, including drilling and oil field services, to localise production and create domestic supply chains. These new businesses, allied with technology centres to spur innovation and foster development of advanced materials and processes, will contribute to greater economic diversity and drive job creation. Oil, gas, and chemicals companies require large quantities of materials, supplies, and services to conduct their operations. Saudi Aramco believes that by raising its purchase levels of domestically produced materials Saudi Aramco will also help support the kingdom’s drive for economic diversification and job creation. Major manufacturing industries such as offshore structures, drilling equipment, instrumentation, and consumables – as well as services such as construction, storage, transportation, and facility maintenance – are targeted by this strategy. Ultimately, Saudi Aramco expects to source 70 per cent of all material procurement needs with locally manufactured goods, doubling the current rate of 35 per cent. To meet this goal, it is taking proactive steps to build the capacity of local supply chains, providing technical support to improve new manufacturers’ technical abilities and raising production standards and specifications to international levels. Helping build capabilities in this manner will enable domestic businesses to supply its needs and also export up to 30 per cent of their products to the global market. Saudi Aramco may also give priority to local manufacturers for certain bidding opportunities, provide premiums for new product lines that create jobs for Saudi nationals, and enter into extended purchase agreements to provide local suppliers with a business stream that fosters their long-term viability. Creating the conditions that are attractive to local and international investors is a key element in achieving this strategy. To do so, Saudi Aramco has established vehicles to explore taking equity with investors who are looking to establish a presence in Saudi Arabia. Among the various investment subsidiaries are the Aramco Entrepreneurship Centre, Saudi Aramco Energy Ventures, and the Industrial Investment Company, a joint venture between Saudi Aramco, Sabic, and the Public Investment Fund that focuses on larger business transactions within the energy sector. Ultimately, these efforts will help diversify and expand the national economy and generate more career opportunities for the next generation. Approximately 500,000 direct and indirect jobs are expected to be created as a result of its efforts to spur growth in the Saudi energy services sector. Thousands more employment opportunities will become available in the conversion parks connected to its chemicals facilities and within their associated supply chains. Most of these jobs will be technical in nature and many will be in industries that are new in the kingdom. New industries and jobs mean new specialised skill requirements. Local employers and new businesses generated by foreign direct investment will require a workforce with the skills to help their firms prosper. The key to building a competitive local workforce is to make sure that Saudi workers are ready — through access to the right knowledge and training — to fill the jobs created by these new types of economic activity. In 2014, Saudi Aramco invested in numerous initiatives aimed at increasing the kingdom’s human capital, training employees and non-employees alike. 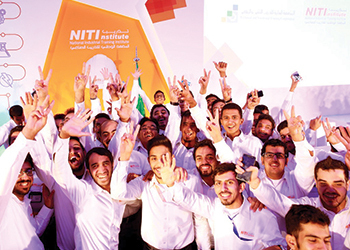 The National Industrial Training Institute (NITI), a nonprofit organisation, is a joint undertaking between Saudi Aramco and the Technical and Vocational Training Corporation. The institute comprises two facilities. The first, in Al-Hasa, will host Saudi Arabia’s largest and most ambitious vocational training institute with a capacity for 3,000 trainees. In October, the Al-Hasa branch commenced operations, welcoming 352 trainees: 252 from Saudi Aramco and 100 from PetroRabigh. The second facility, located in Abqaiq, can accommodate 400 trainees. The Abqaiq site opened in April, with 316 trainees in the initial class, including 275 from Saudi Aramco, 22 from Yasref and 19 from Satorp. The new facilities represent its commitment to unlocking the technical potential of young Saudis in a sustainable way. NITI will train and develop Saudis from high schools and technical colleges for in-demand technical occupations that are coming to the kingdom in a time of both operational expansion and greater market and technical complexity. The main programme is two years, followed by six to 12 months of on-the-job training. The programme mix contains unique elements such as chemicals training, globally accredited training programmes, blended interactive learning, and smart classrooms, as well as technology-based training solutions. NITI trainees will emerge competent and skilled in their specialisations, proficient in English, literate in the latest computer and technological applications, and armed with safety awareness, discipline, and a strong work ethic. The Jazan Refinery and Terminal project is one example of how Saudi Aramco is amplifying the benefits of its business activities for the benefit of local communities. Saudi Aramco formed a nonprofit organisation, the Jazan Contractors’ Consortium for Training and Employment or "Maharat," with its local and international engineering, procurement, and construction contractors to train qualified Jazan-area high school, technical, and industrial college graduates in specialised construction trades. These young people are then employed by the consortium to support the construction of the Jazan Refinery and Terminal, giving them an opportunity to start a career and make a tangible contribution to the economic development of their communities. The consortium’s training centre builds skills in carpentry, rebar fixing, plumbing, scaffolding, pipefitting, and welding. Saudi Aramco anticipates that the success of this initiative will lead to training in more advanced trades such as electrical, instrumentation, foreman, crane, and heavy equipment operation. The Jazan Contractors’ Consortium is a sustainable model that Saudi Aramco intends to replicate and institutionalise for all future mega-projects. Saudi Aramco continually looks for ways to amplify the benefits of its business activities. In a pioneering collaboration with General Electric (GE) and Tata Consultancy Services (TCS), Saudi Aramco established a new Business Process Service Centre designed to create nearly 3,000 jobs for Saudi women within the next three years. TCS, its partner and a world leader in business process services, will operate the centre. The centre, located in Riyadh, is the first all-female business service centre in the kingdom. The centre already has more than 400 full-time female employees providing business support to many of its company departments — and to GE — in the fields of finance and accounting, supply chain management, and human resources. The centre is providing business services to GE customers in 39 countries throughout the Middle East, Africa, and Europe. By outsourcing such services, companies are able to focus on their core activities while helping to create quality and sustainable employment opportunities for women in Saudi Arabia. Not only does the centre contribute to the kingdom’s strategy of diversifying the economy and creating employment opportunities for Saudi female graduates, it is also helping to meet three specific kingdom development goals: Provide sustainable jobs that are not directly dependent on natural resources, develop skills needed in the local labour market, and establish a venue by which Saudi women can participate effectively in the labour market. Saudi Aramco signed a Memorandum of Understanding with Princess Nourah Bint Abdulrahman University to cooperate on the conceptualisation of a Women’s Business Park on the university’s campus. The business park is envisioned as a bridge between academia and the workplace. Students and graduates of the university will have first choice to train and work in all-female services-based companies located in the business park. The Tata Consultancy Business Process Service Centre will be relocated to the Women’s Business Park as an anchor tenant. The university has allocated a number of available dormitories as interim buildings for the business park in its conceptual stage and Saudi Aramco is sponsoring a feasibility study and conceptual master plan. The Women’s Business Park is anticipated to create 10,000 to 15,000 jobs for Saudi women. Part of its strategy to build healthy communities involves partnering with nonprofit agencies to buttress their work that advances its own social goals. In 2014, Saudi Aramco signed a Memorandum of Understanding with the Fatat Al-Qassim Development Centre in support of their Business Incubator programme. The mission of the business incubator is to help female Saudi entrepreneurs whose business ideas have the potential to spur economic growth in the Qassim region. Through more than 3,750 hours of training combined with 450 hours of consultation with a business specialist, 25 female entrepreneurs will receive training in areas such as market analysis and business plan development to help them successfully launch their businesses.